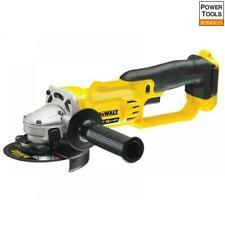 DEWALT DCG412N 125mm XR Premium Angle Grinder 18V. DCG412M2: 2 x 18v 4.0Ah XR Li-ion Batteries. DCG412M2: 1 x 18v 4.0Ah XR Li-ion Battery. The powerful and highly efficient PM58 DEWALT fan cooled motor has replaceable. The DEWALT DCG405FN XR Brushless Grinder has a flat head design for access to acute angles with a compact gear case for increased access to tight spaces. Our aim is to provide you with top quality products, at trade prices, straight to your door - hassle free. The DEWALT DCG426P2 DCG426 XR Brushless Die Grinder is supplied with DCG426P2: 2 x 18V 5.0Ah Li-ion Batteries. 2 x 18V 5.0Ah Li-ion Batteries. Our aim is to provide you with top quality products, at trade prices, straight to your door - hassle free. The DEWALT DCG426P2 DCG426 XR Brushless Die Grinder is supplied with DEWALT Part no: DCG426P2-GB. 2 x 18V 5.0Ah Li-ion Batteries. The DEWALT DCG414T2 XR FlexVolt Grinder is supplied with The DEWALT DCG414XR FlexVolt Grinder has a brushless motor for improved performance, even in demanding applications. With a recessed spindle lock design that allows max depth of cut and greater protection to button, especially when its used in confined spaces. The DEWALT DCG414T2 XR FlexVolt Grinder is supplied with DEWALT FlexVolt XR batteries stand at the forefront of cordless technology. 2 x 18/54 Volt 6.0/2.0Ah Li-Ion Batteries. 1 x Blade Wrench. Specifications of the Dewalt DCG412M2 Tstak Case. DeWalt 18V XR Lithium-Ion Angle Grinder with Batteries. Latest generation 18V XR Li-Ion premium Grinder featuring new XR 4.0Ah li-ion battery technology. DCG412M2 125mm XR Premium Angle Grinder 18 Volt 2 x 4.0Ah Li-Ion. The powerful and highly efficient PM58 DEWALT fan cooled motor has replaceable. Panther Trading was established in 2013. We have category specialists that source products globally and we have a product catalogue of over 3,000 different products. 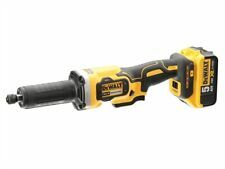 Amoladora de batería DeWALT DCG412M2-P2 DCG 412 M2 caso T-STAK. (P2 5.0 Ah batería). Marke DeWalt. T-STAK maleta. Spannung 18 V. Leistung 405. EAN 5035048555545. Capacidad de la batería 5.0 Ah. DeWALT DCG405N 18V XR Brushless Cordless Compact Angle Grinder 125mm Bare Unit NEW. The Dewalt DCG405N 18v XR Li-ion 125mm Brushless Angle Grinder with compact gear case for increased access to tight spaces. Dewalt DCG405N 18v XR Li-ion 125mm Brushless Angle Grinder. 2 x 4Ah Battery DCB182. The Dewalt DCG405N 18v XR Li-ion 125mm Brushless Angle Grinder with compact gear case for increased access to tight spaces. The DeWalt DCG412N is the latest generation premium grinder featuring new XR Lithium-Ion Technology. Designed for efficiency and making applications faster. 2x DCB184 5Ah Battery. Battery Chemistry: XR Li-Ion. Dewalt DCG405N 18v XR Li-ion 125mm Brushless Angle Grinder. 1 x 4Ah Battery DCB182. The Dewalt DCG405N 18v XR Li-ion 125mm Brushless Angle Grinder with compact gear case for increased access to tight spaces. The DeWalt DCG412N is the latest generation premium grinder featuring new XR Lithium-Ion Technology. Designed for efficiency and making applications faster. 2x DCB182 4Ah Battery. Battery Chemistry: XR Li-Ion. The DeWalt DCG412N is the latest generation premium grinder featuring new XR Lithium-Ion Technology. Designed for efficiency and making applications faster. 1x DCB184 5Ah Battery. Battery Chemistry: XR Li-Ion. Drill Bit Extractors. We will need the following points confirming Spanners Hook & Caliper Face. Power Tools. Power Tool Accessories. Corded Power Tools. Power Tool Bits. General Purpose Torches etc. 54V Brushless Motor. Product Contents: Grinder, Side handle, Keyless protective guard, Blade wrench. Trigger Release Wheel Brake. Equivalent to a 405W mains unit. During that process you will be issued with an RMA number. I think my item is lost. Sadly instances of fraud are on the increase. Pry Bars Heelbars & Wrecking. Pressure Washers Steam Cleaner. What we will do. Power Tool Bits. Cordless Tools & Accessories. Still no luck. Specification No Load Speed: 7,000/min. The powerful and highly efficient PM58 DEWALT fan cooled motor has replaceable. Health & Safety issues are more and more demanding and we understand the vital necessity of production lines being up and running whenever they are needed. DEWALT DCG412N 125mm XR Premium Angle Grinder 18 Volt. Dewalt DCG405N 18v XR Brushless Cordless Angle Grinder 125mm - Body Only. 18V brushless motor for efficiency, improved application performance and power. 18V Brushless motor for efficiency, improved application performance and power.